Sunny in CAL: Best Lemon Bars Ever! Best Lemon Bars Ever!!! Totally self proclaimed but I think many people will agree! Disclaimer - Please consider yourself warned. 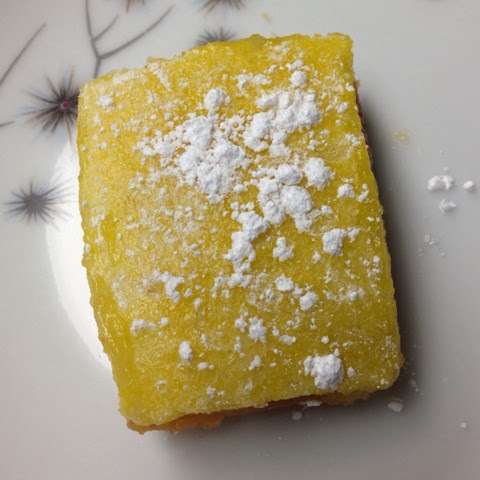 These lemon bars are highly addictive and can cause serious weight gain. Do not blame me. Ok? In a bowl, blend together softened butter, 2 cups flour and 1/2 cup sugar. Mix until it's gets like play doh. Press into the bottom of an ungreased 9x13 inch pan. Or something the same size. Bake for 30 minutes, or until firm and golden. If it isn't, bake for another 5 mins. In another bowl, whisk together the remaining 1 1/2 cups sugar and 1/4 cup flour. Whisk in eggs and lemon juice. Pour over the baked crust. The bars will firm up as they cool. Sprinkle some powdered sugar on top. Slice into squares and enjoy!! !